Sure, I do love visiting the mall and local fashion boutiques for big brands and custom-made Indian ethnic kurtis, but some of my favorite summer fashion kurtis don’t reside at big stores or boutiques. And if they do, the prices aren’t lucrative. No wonder, I always have a soft spot for online shopping and fashion shopping sites like Jabong. Not only do they have a wide variety of brands and options to choose from but with their daily deals and discount offers on big ethnic wear brands like Biba, W, Global Desi, Sangria and FabIndia they also make it easy to treat yourself without breaking your bank. Forget fussing with an off-shoulder dress that constantly needs readjustment. Take on the trend this season with this black printed kurti that elegantly exposes your décolleté and shoulders with its see-through net fabric. 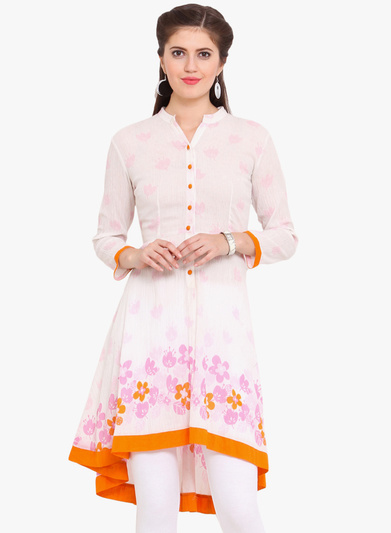 The asymmetrical off-white kurti with floral hem-line is perfect pick for both spring and summer. It adds modern shape to any silhouette, making one look feminine and trendy at the same time. And at INR 624, it’s a steal deal! 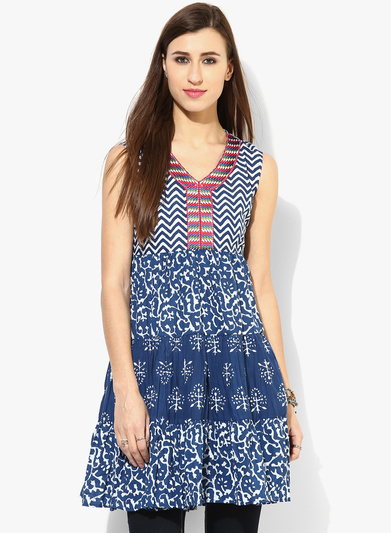 Geometrical print gets an update this season with a spectrum of bright colors and inclusion in Indian ethnic wear. 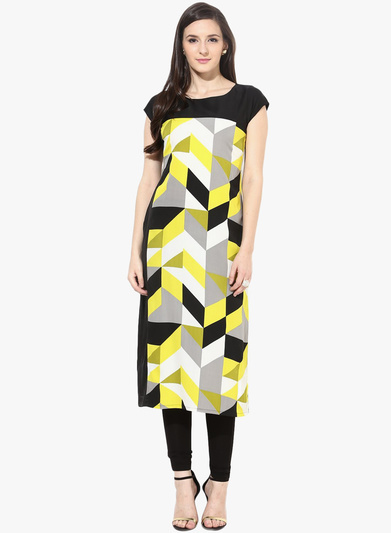 Brighten up your wardrobe and look classy with this stylish kurti from the house of Kiosha. Anarkalis rock anytime. And if you want to know the reason why, click here. 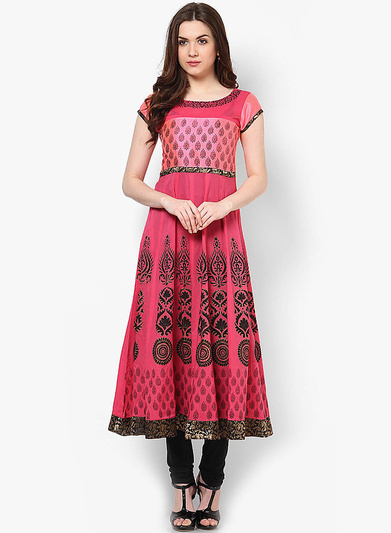 I just love the color and head turning detail of this kurti. Perfect pick to go festive for spring summer 2016. This is so old-school! 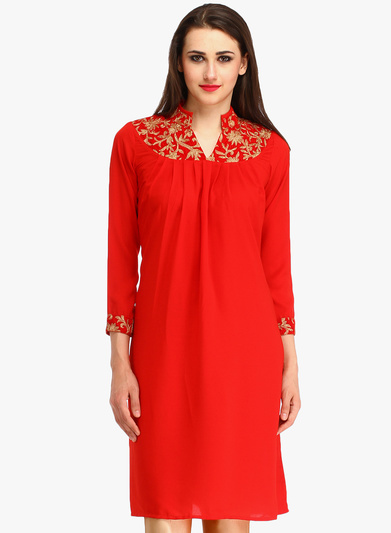 I have worn this kurti (same red color and somewhat similar design) back in my maiden days. But there’s something sartorial about this kurta that makes me come back to it again! I love this aqua blue kurti with contrast trims. Fine cotton fabric and sleeveless design make this one look so cool, summer-ish and trendy. Well, these are my love finds that I came across at Jabong website while looking for some affordable fashion kurtis for summer. What are your favorite picks for the season and where do you like to shop for Indian ethnic kurtis? Would love to know about your preferences and shopping finds for summer 2016. In the hot summers we experience in India we need comfortable clothes. These look perfect! no. 5 is so beautiful!! They are all so pretty! I would look great in #3. They are all gorgeous, 5 would be my favourite though if I had to choose! oooo!!! i love # 5 & 6!!! love bright colors! cool post! These look absolutely gorgeous! Couldn’t see myself wearing one, but those sure are pretty! Lovely Kurtis!! I love to buy these kurtis online. Thanks for sharing with us. These are all good. Thanks for sharing this post. In summers most of the people prefer to wear cotton wears because the comfort and coolness they give while the whether is too hot.